A bear named Ernest, voiced by Forest Whitaker, befriends the young mouse Celestine, voiced by Mackenzie Foy, even though their societies forbid it. Animated movies excel in bringing to life the impossible stories, the ones drawn from fairy tales and mythology and the ones exploring the imaginary lives of creatures and things. It's an incredibly attractive notion, isn't it, to imagine there's a whole world going about its business, just out of sight? 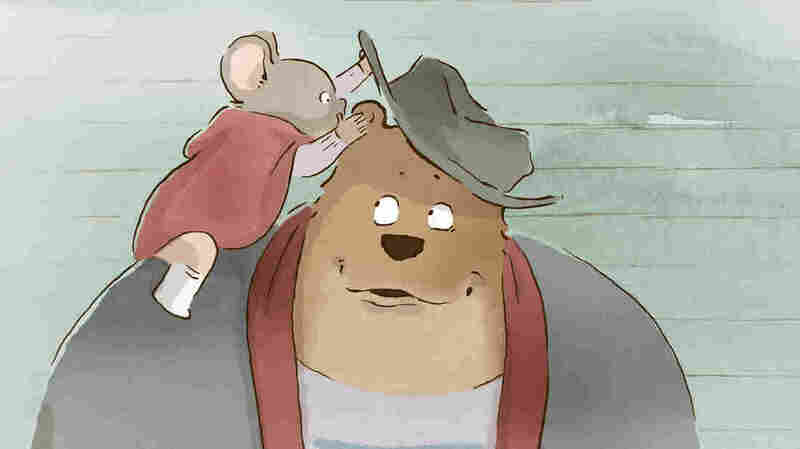 The French-Belgian animated film Ernest & Celestine takes on that idea twice over, investigating the fictional lives of bears and mice, two societies living side by side, utterly intrigued by and terrified of each other. Based on the long-running book series written and illustrated by Belgian-born author Gabrielle Vincent — and animated with backgrounds of stunning hand-painted watercolors — Ernest & Celestine tells the story of the meeting and unlikely friendship between a big bear and a little mouse. Bear and mouse communities have their differences, mostly to do with portion sizes, but from the outside they have much more in common: They're highly concerned with rules, well-intentioned but quick to judge, entirely distrusting of the other species. Each haunts the other's fairy tales: The mouse fills the role of tooth fairy in bear mythology, while bears are the sharp-toothed, ravenous monsters in stories told to little mice in the dark. The young mouse not buying those tales as told is Celestine (Mackenzie Foy), a bright orphan and talented painter living in the orphanage of a complex mouse civilization located in the sewers beneath a bear town. The children's ancient caretaker (Lauren Bacall) likes to warn her charges about the bear menace while she casts terrifying shadows on the wall (in rich dark chocolate browns and saturated coffee-stain blacks), but Celestine likes to draw pictures of her ursine neighbors. She makes covert trips to the surface to gather bear teeth for her dentistry internship — this movie is really into teeth — but she's shunned by the other mice and yearns for a friend. Living aboveground in a town with cobblestone streets and cozy shops and police who ticket for street performing, the bears largely stand in for humans in this story, though they have greater appetites for food and sleep. Some respectable bears like George (Nick Offerman) and Lucienne (Megan Mullaly) make their living peddling sweets or replacement teeth, respectively, but refuse their son candy, all too aware of the racket they run. Then there's Ernest (Forest Whitaker), ignored and misunderstood, living in a quaint cottage outside the town and scraping by as a starving but talented musician. Ernest gets laughed off, his songs scoffed at by adults, his instruments impounded when he tries to sing for his supper. His ensuing hunt for anything food-adjacent leads him to almost eat Celestine. Celestine's no pushover, though, and Foy makes her character's boldness in an unmanageable situation seem the most obvious, logical response. She shows a maturity the sleepy Ernest lacks, and they slowly develop a friendship that's at first transactional: Their different sizes and backgrounds mean one has knowledge about food, while one has the skills to collect teeth the other just doesn't. With a little trust and despite plenty of misgivings, they develop a relationship that's part father-daughter, part mentor-protege and several parts partner-in-crime. They quickly run afoul of both their societies, violating all kinds of laws, and they go on the run. Ernest & Celestine is a tale of found family, sweetly realized and supported by clever writing and talented voice work, but it's the animation that really makes this Academy Award-nominated movie. The characters are computer-rendered, but the watercolor environments they move in are expressive and detail-rich.